After their outdoor wedding ceremony at at Toronto Botanical Garden, it started raining and we had to postpone the bride and groom photo shoot. Because and bride and groom met in Downsview Park, they wanted to have their post wedding photo shoot in the beautiful park. However, the biggest challenge was to create wedding pictures with an urban look to complement the beautiful images we created during their wedding day. This image of the bride and groom is one that many couples mentioned they loved. In this photo, the groom sits on the bench and the bride is laying on the bench with her head in his lap. The photograph was lit with a flash placed left of the camera on a light stand. To give the image a sense of stability I chose a central composition. The bride and groom are positioned along the bottom horizontal line of the rule of thirds grid leaving plenty of negative space above them. That creates a sense of movement towards the top of the frame which symbolizes a superior new era in their lives. To make the image timeless, I chose a black and white processing. I also added film grain in the shot to be consistent with the vintage look of the photograph. 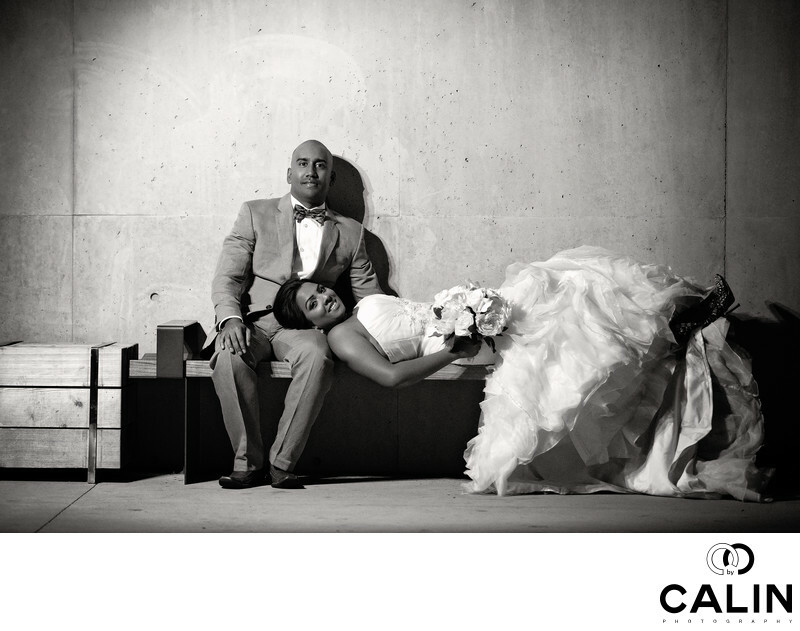 The shot was the last in a series of images taken at the Downsview Park in this particular post wedding photo shoot. Location: 35 Carl Hall Rd, Toronto, ON M3K 2B6.